This day provided a one-day breather between the religious celebrations of the month and was called the cara cognatio, or Caristia, which means the day of grace or care but could be translated as "Family Love Day", is a feast of favor and good will in honor of the goddess Concordia. On this day Roman fathers would pay special attention to their own families. This was a family thanksgiving celebration without any particular religious significance, which in that regard, is essentially the same as our own. Disputes between family and friends are settled today and presents were given with the intent of reconciling friends and relations. Near relations come to honor the familial deities, the Lares, with offerings of incense and food. This holiday also serves to strengthen family bonds. After so many days of honoring the dead, the celebrants rejoice in the living. "Sweet it is, no doubt, to recall our thoughts to the living after they have dwelt upon the grave and on the dear ones departed from us; sweet, too, after so many departed, to look upon those of our blood who are left, and to count kin with them," wrote Ovid about this festival. February is sacred to Mars and to Juno, also called Saturnia. Known as Hera by the Greeks, she was the daughter of Cronus (Saturn) and regarded as a paragon of motherly virtues. She was the divinity of sacred marriage and childbirth, and was prone to violent wrath at every violation of her marriage bed with Zeus. This one-week festival offers Christian believers the last chance to feast and party -- Carne Vale means "so long, meat!" -- before the penitential season of Lent begins. The festival culminates on Shrove Tuesday, the famous Mardi Gras (Feb. 28), when since the old days it is still customary to eat pancakes filled with sacred and medicinal herbs. The cakes are said to protect the believer against shortages of food and money during the coming year, provided they are eaten before 8:00pm. It is said that, festivals being what they are, the cakes are often washed down with beer, or wine, even both. To replace the pagan festivals of the Concordia, the Church made this day the feast of St Peter's Chair, celebrating his role as teacher and feeder of that flock of sheep, the faithful. However in 567, at the second Council of Tours, people were still "offering mashed food to the dead." Many early blooming plants are named after Peter including the cowslip in England which may be called Peterswort, and daffodils in Wales which are called Peter's leeks. There are also many legends about ice on St Peter's Day. The Germans say that if water is frozen on this day it will not melt for a fortnight. The Norwegians extend this to 60 days. The Norwegians also say that St Peter threw hot rocks at the ice to melt it, or that if there is no ice on this day, he will make it. It is also believed that the weather on this day will last four weeks, or forty days, or all of spring. However, if there is sun enough to saddle a horse, or moisture on a roof sufficient to slake a hen's thirst, then there will be a good harvest. Sybil Leek (1923-1983) was born today. 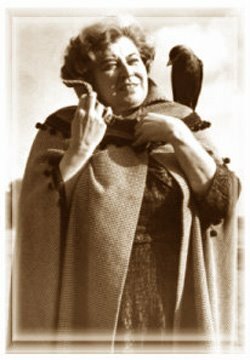 Sybil Leek was an English Witch, a gifted psychic, astrologer, and prolific author who wrote more than 60 books on such subjects as Astrology, Numerology and Reincarnation. She was born with a witch’s mark and claimed to be a hereditary witch of Irish and Russian Descent. Her entire family was involved in astrology and some of the guests who visited her childhood home included H.G. Wells, T. E. Lawrence (of Arabia) and Aleister Crowley.